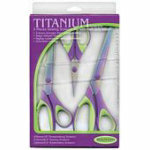 3 pc set Titanium Scissors, including 10" Dressmaker, 8.5" sewing and 55" embroidery scissors. Softgrip inlays. Titanium is 3 times stronger than stainless steel.